How did climate change affect the rise of the Homo Sapiens? Why did people start to farm? Why did the Vikings die out in Greenland? How are humans remaking climate change today? These questions, and many others, will be addressed in an upcoming course offered in our Fall 2016 semester. Today, we're excited to tell you a little more about it. Over the course of the past one hundred thousands years, climate change has helped to shape the prehistory of humans, the establishment of agriculture, and the rise of human civilization. Since that time, humans have had increasing impact on the environment, and are today a major force in changing the climate. How and why has climate changed in the past? How has climate change affected human history? 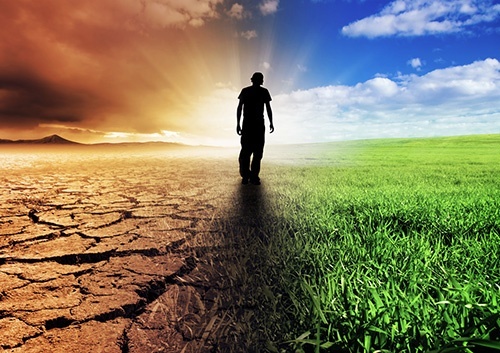 How have human societies changed or altered climate? Climate change and human history have been closely connected for thousands of years. This interdisciplinary course, Climate Change and Human History (GEOG/HIST 2056), combines climate science and history to explore the connections between civilization and climate from the last ice age to the present. This course will also provide students with the scientific and historical background to better understand one of the key issues facing today’s world. The course does not presume any previous background in science. This course will meet on Mondays and Wednesdays from 2‐3:15 pm during the Fall 2016 semester. For more information please contact Professor Elizabeth Gordon (978.665.3083) or Professor Benjamin Lieberman (978.665.3090).